On April 19th, 2017 United Help Ukraine fulfilled the promise to help with buying a car for wounded soldier Anatoly Horbenko. 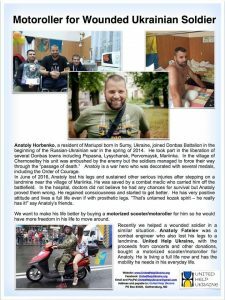 Anatoly Horbenko, a resident of Mariupol born in Sumy, Ukraine, joined Donbas Battalion in the beginning of the Russian-Ukrainian war in the spring of 2014. He took part in the liberation of several Donbas towns including Popasna, Lysychansk, Pervomaysk, Mariinka. In the village of Chernoseltsy his unit was ambushed by the enemy but the soldiers managed to force their way through the “passage of death.” Anatoly is a war hero who was decorated with several medals, including the Order of Courage. In June of 2016, Anatoly lost his legs and sustained other serious injuries after stepping on a landmine near the village of Mariinka. He was saved by a combat medic who carried him off the battlefield. In the hospital doctors did not believe he had any chances for survival but Anatoly proved them wrong. He regained consciousness and started to get better. He has a very positive attitude and lives a full life even with prosthetic legs. “That’s untamed kozak spirit – he really has it!” say Anatoly’s friends. This entry was posted in Wounded Warrior and tagged car for wounded, Heavenly Hundred, soldiers, wounded. Bookmark the permalink.